It’s Jeudi, and so time to look at a non-new release you might enjoy for the weekend. This week I have chosen a film more delicious than oysters from a Mardi chicken and so full of amour it made me weep for those who go without it, including the suicidal gold fish. I adore films that are visually appealing and Amelie does not disappoint. Director Jean-Pierre Jeunet uses color as part of his story telling technique. He presents a beautiful make believe world that flavors the movie and bolsters a lovely little simple story into a unique and interesting experience. Amelie is a boy meets girl story, but they are not your usual boy or girl. Audrey Tautou, (later of The Di Vinci Code) is Amelie, an awkward girl who prefers fantasy to real life. However, her discovery of a mysterious hidden box changes her life as she tries to change other’s lives for the better. A chance meeting of a man at a photo booth leads to Amelie solving not only the identity of a mysterious man, but also the sweet mystery of life. Reality shared with one of her ilk is not so bad after all. Our boy, the charmingly odd Nino is portrayed by Mathieu Kassovitz. Also a loner in his own world, Nino excites Amelie’s heart the first time she lays eyes on him. Amelie’s world also includes a sadistic grocer to whom she teaches a lesson, a lonely concierge, a one armed man, who is not a fugitive, and a man with bones of glass. These are but a few that are touched by our heroine on her quest to be a regular do-gooder. Nominated for five Academy awards, this French film has sub-titles, but you get used to it quickly. Just be careful not to miss too much of the intriguing camera work or engaging acting done by all. 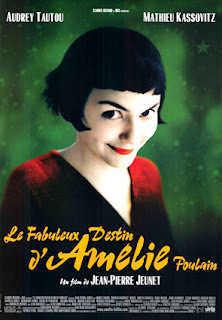 Filmed in Paris, you can follow Amelie’s trek around the city at: Montmartre: in the footsteps of Amélie Poulain. Amelia has all the ingredients of a great film. A mirepoix of romance, comedy and mystery, the box calls it “The feel-good movie of the year.” The film did make me feel good, but it also made me sad for all the people who can’t or won’t give up their weirdness or accept the weirdness of someone else to find the love and/or companionship they want.